A day in the life with Spencer the American Pit Bull Terrier puppy. Spencer's 24th week—33 weeks old, 73 pounds, 22 inches from the ground to the highest point of the shoulders (the withers). About 7 1/2 months old. 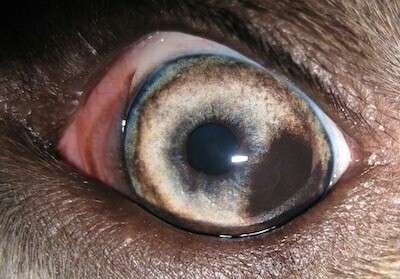 The brown spot in Spencer's left eye. Sara teaches Spencer to touch things with his nose on command. "Touch it,"
The morning Bruno was dropped off at the vet for his surgery Spencer came along for the ride. He waited in the car as Bruno was checked in. On the way home we stopped off at a random neighborhood and went for an hour-long walk. 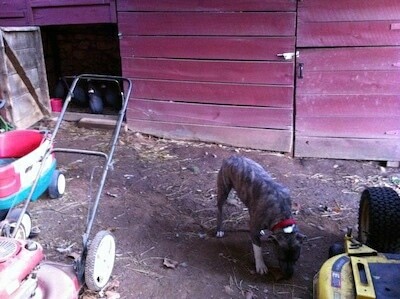 When we arrived home Spencer went into the house and started looking for Bruno. He danced over to the dog bed then checked the kitchen crate. He seemed confused; Bruno was not there. That night we went for a second hour-long walk. The next morning Bruno was coming home. Before picking Bruno up I took the pack for another long walk to help keep everyone as calm as possible for Bruno's arrival. Spencer did not ride along to pick Bruno up, he waited at home. 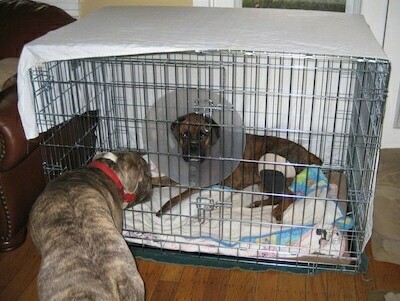 I had gotten Bruno settled in his own crate before letting Spencer out of his. It is a good thing Bruno was in a crate when they were first reunited because the pup, even with all of the exercise, was excited to see his big brother return home. The walks did pay off, however because the pup soon calmed down and went to sleep. 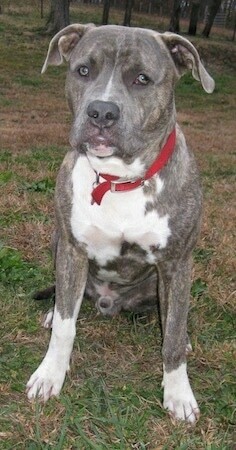 See more of Bruno's ACL Ordeal. Spencer seems to have gotten very gentle around Bruno. The first day Bruno came home Spencer had tried to start a play rumble as usual. Bruno had let out a little growl to let Spencer know he was not up to it and Spencer had immediately backed off. It did not take long for Spence to stop trying to play. I think he realized Bruno was injured. We have been keeping Spencer very well-exercised to help him stay as calm as possible around Bruno. 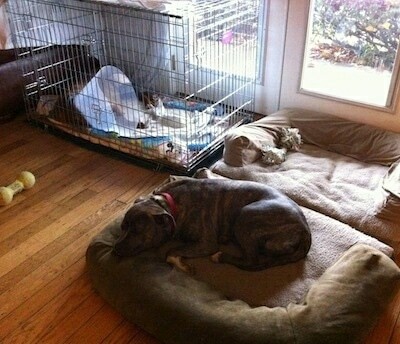 When Bruno first came home I had to tell Spencer not to play with Bruno. Over and over I had to remind him. I tried to put Bruno in his crate when the pup was wanting to play. Once Spencer was next to Bruno who was lying down and he sat down on Bruno's bad knee! Bruno let out a growl and Spencer immediately jumped off of him. I try to distract Spencer away from Bruno and put Bruno in a safe place. I have been asking Spencer to "leave it," meaning to leave Bruno alone without it seeming like a punishment. Yelling at him as if he was being punished would not be good for the pup mentally, however he still has to be asked to be careful around Bruno, not to play or jump on him. I believe that Spencer is starting to understand that he needs to give Bruno his space. 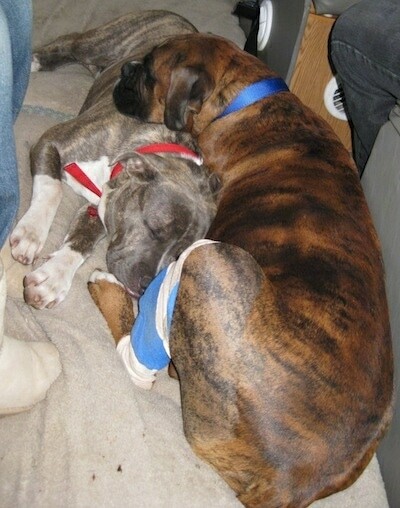 He still lies with Bruno, even snuggling up next to him, but he seems to be more careful about it, as if he is understanding that Bruno is injured. 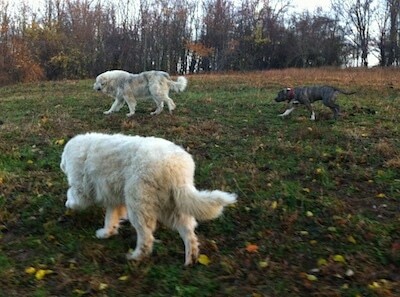 I decided that Spencer needed to get out and see the Pyrenees for some dog socialization. I brought the pup along on my morning farm rounds. Notice how the guineas have not yet come out of the open stall door. I had opened up the door and they spotted Spencer. They waited in there until Spence walked away. Spencer inside the chicken coop. 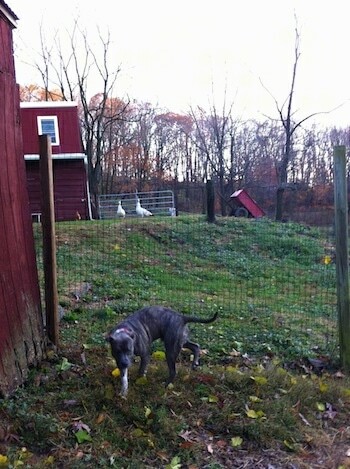 Notice the pea hens in the background. Spencer was a very good boy. He kept looking at me for direction as if to say, "What are we going to do next? Where do you want me to go?" At night the Great Pyrenees are in the area around the chicken coop to keep the fox, raccoons, opossums, skunks and other wild animals from eating all of the birds. During the day, however they are put over with the goats. Spencer gets to go along with them.